If you want to take a break on the road between Russia’s two capitals, then enjoy some time in the ancient city of Tver and its surroundings. Tver residents say their city suffers from the bad luck of being located between Moscow and St. Petersburg because many of its best educated and talented people gravitate to the opportunities in those much bigger cities. "All they leave in Tver is sh***," said one local taxi driver. This is quite a pessimistic view, and so let's be very clear right away: They don’t love Muscovites here. Actually, Tver’s populace always thought their city should have been Russia’s capital. As a result of centuries of conflict with Moscow’s princes, however, Tver was several times occupied, looted and burned to the ground. Unfortunately, except for the old kremlin and several medieval churches, there is not much left to see today. Still, during your walk through the city you’ll see that it prospered and continues to thanks to its strategic location between the capitals. In fact, famous architects often worked in Tver before they took on bigger projects in Moscow or St. Petersburg. To see the most important sights, take a walk along the embankment of the Volga River, which begins not far from Tver. In winter you can cross the frozen Volga by foot or ski. At Stepan Razin Street you will see a long block of beautiful old merchant houses. Often film crews, who want to depict old Moscow, in fact shoot movies here. On the other side of the river you can see the white-blue-green convent of St. Catherine. Pay a visit if you want to dive into the world of silent tiny Russian churches. The architects, however, hadn't properly studied the unsteady ground underneath, and this mistake became obvious in summer 2017 when parts of the building collapsed. 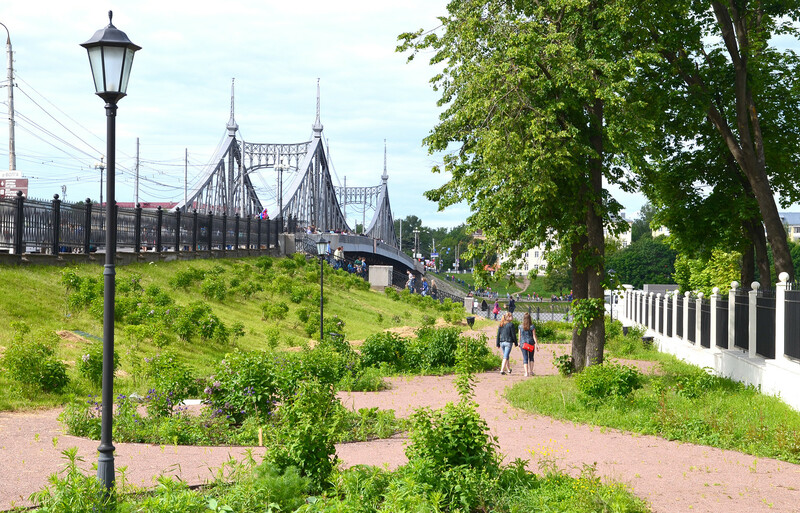 Tver's 'Old Bridge' is a copy of the famous metal bridge in the Hungarian capital, Budapest. Another bridge across the Volga has quite a European history: It’s a copy of the famous metal bridge in the Hungarian capital, Budapest. From the views at the beginning of the big steel structure, you can’t be sure whether you’re on the Danube or on the Volga. Between the two bridges stands Tver's cultural center: The eye-catching Zvezda cinema ("Star“) was built in 1937 in the prevailing constructivist style. According to local legend, however, the architects mixed up two project and this building should have been built in Uzbekistan’s capital, Samarkand. But most likely this is just a way how the locals rationalize such unusual architecture in their region. Alexander Pushkin greets you from the river Volga. 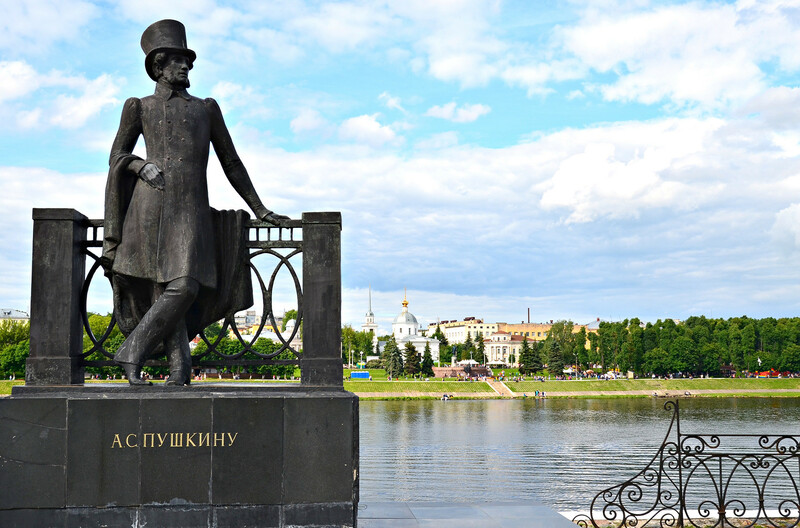 After making a small circle through the city park you return to the river where Alexander Pushkin will greet you. He used to travel a lot in the region. On the opposite side of the river you are greeted by Afanasy Nikitin - a traveler born and raised in Tver who sailed across the 'three oceans' to India, but unfortunately never returned home. One of Tver's most beautiful sights is the recently renovated palace of Catherine the Great. 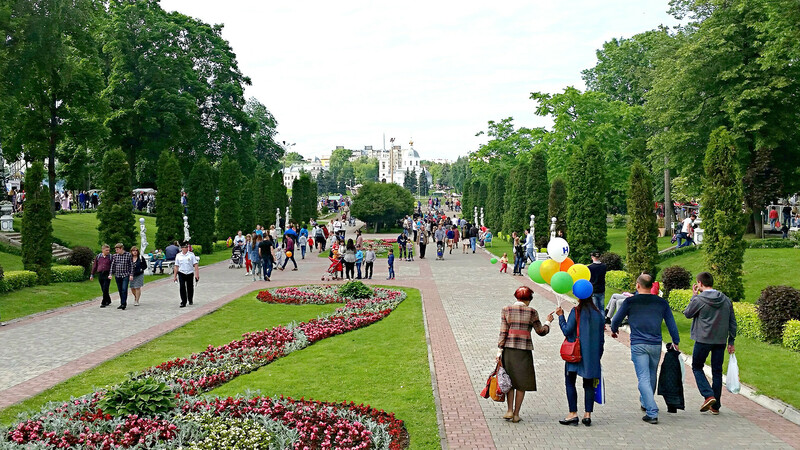 This palatial complex and park, which suffered through revolution and war, has been rebuilt using historic photographs and original documents. In the 18th century, the palace was originally built as a travel lodge for Catherine the Great, who often journeyed between the two capitals. The local art museum is also worth a visit: From old Russian religious artifacts to the classics: Shishkin, Aivazovsky and Repin, as well as Soviet propaganda porcelain. Here, you can find iconic pieces dating to every epoch of Russian art. To complete your first day in Tver, two pedestrian zones - Tryokhsvyatskaya and Radyshtsheva - await you with cafés, restaurants and bars. Although the city seems to be small and provincial, its gastronomical culture is well developed. Here you'll find an Italian restaurant with 'Italian' cheese made in Russia next to local cuisine classics on a cozy indoor terrace, or fresh milled coffee and homemade cakes. 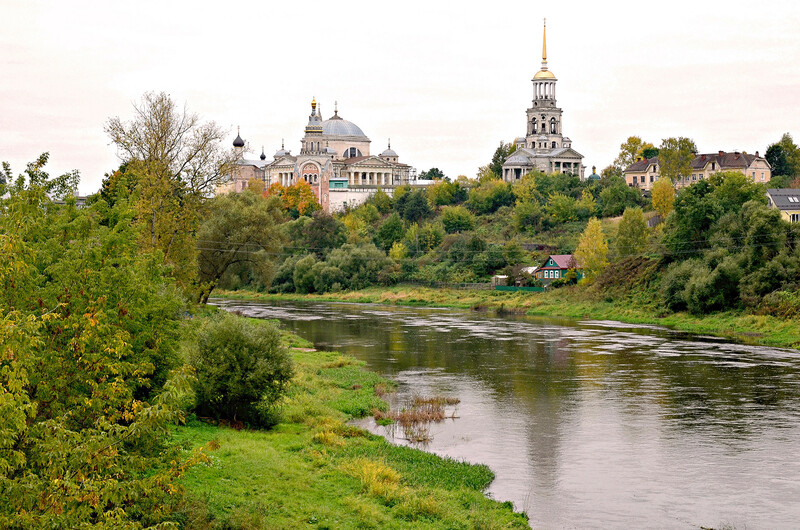 You can also watch a Video about Tver and its sights here! On the second day you have many opportunities to leave Tver and immerse yourself in serene and pure country life. Staritsa's Dormition Monastery was founded in the 16th century. 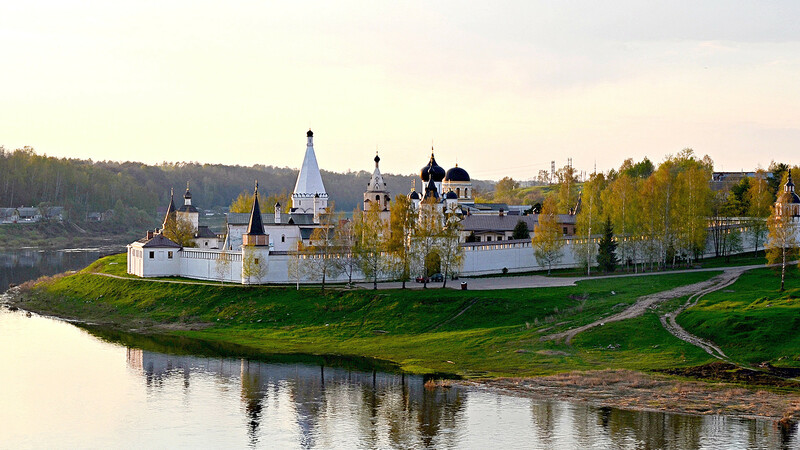 In the middle of the central bridge in Staritsa (about 65 km northwest of Tver) you will be excited: The Volga rushes under your feet and you are standing in a circle on the hills of three monasteries with a dozen old Russian churches. Where to feel yourself Russian, if not here? Staritsa was founded in the 13th century as a river fortress, but the old kremlin didn’t survive its role on the border between warring principalities. Later, the town became a spiritual center of the Tver and Moscow regions. The Dormition Monastery is the most popular and famous here, founded in the 16th century. In case you have a bit more time, you can also visit the country house of the Osip-Wulf family in Bernovo, where Pushkin used to stay with friends and fans. Besides the tiny local museum (link in Russian) and the nearby park, you can enjoy a walk through an authentic Russian village, and feel yourself a bit like a poet! The Monastery of Sts. Boris and Gleb stands high above the river Tvertsa and Torzhok's small but pretty city center. The fair city of Torzhok (60 km west of Tver) is situated on the Tvertsa River, and its favorable location fostered commerce. Just like Tver, Torzhok is sandwiched between Moscow and St. Petersburg: In 1478, Torzhok was annexed by Moscow's ruler, Ivan III (the Great). After the founding of St. Petersburg in 1703, the town became a major hub on the route for supplies moving to the new imperial capital. The post road between Moscow and Petersburg also brought a steady stream of prominent visitors through Torzhok. In the 18th century, these included Catherine the Great and her court; while in the 19th century came writers Pushkin, Gogol, Turgenev and Tolstoy. Like other provincial towns, Torzhok was essentially rebuilt in the late 18th century. Many of the town's prosperous residents rebuilt their houses in neoclassical design, which you can see on the newly renovated embankment. In Torzhok there are two main sights to visit: the Monastery of Sts. Boris and Gleb, and the Museum of the Torzhok Goldwork Embroidery Factory. The most popular sights in Kimry are the beautiful and unique Art Nouveau wooden mansions. 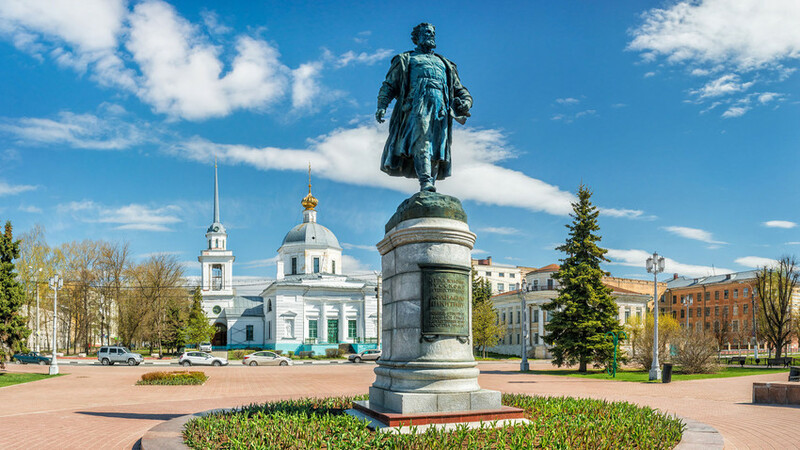 While a trip to both Staritsa and Torzhok can be done in one day, (if you get up early enough), the small town of Kimry (100 km east of Tver) is located in the opposite direction. While it requires a separate day, if you're a big fan of architecture and history, you definitely should go there. Although Kimry was first mentioned in a charter issued by Ivan the Terrible in 1546, only in 1917 was the settlement officially elevated to the rank of city. Like most cities situated between the two capitals, Kimry was a trading center, especially popular for production of leather boots, which were even sent to the great International London Exposition in 1862. Today, these stylish and practical shoes and boots can be seen in the local museum (link in Russian). 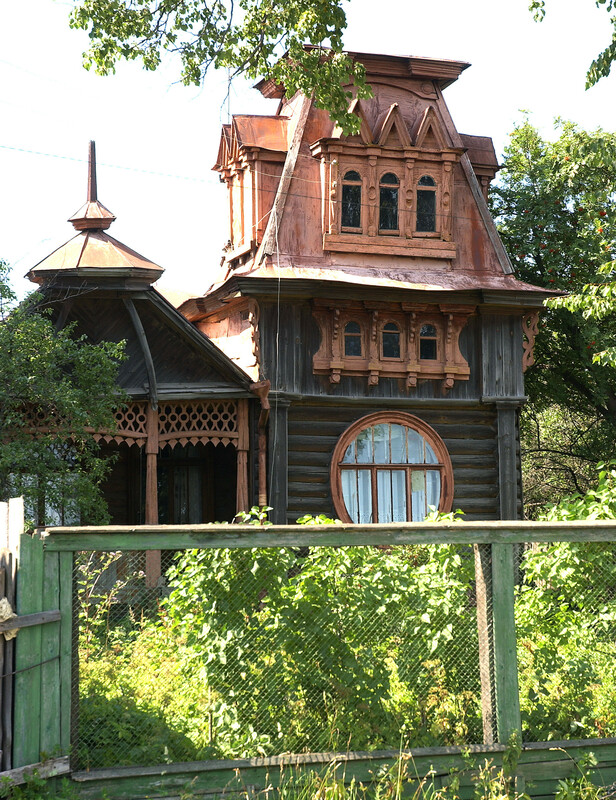 The most popular sights in Kimry are the beautiful and unique Art Nouveau wooden mansions – Russia's only log houses in such style. From Moscow take the comfortable Lastochka suburban trains (almost every hour, tickets can be purchased without a passport) that run from the Leningrad Rail Station. There are also a few high speed trains: Sapsan stops in Tver; as well as long distance trains traveling to St. Petersburg. Of course, there are also buses and mini-buses, but they often get stuck in the long traffic jams near Moscow. From St. Petersburg take any long distance train in the direction of Moscow, but some high speed trains, such as Sapsan, stop here. In and around Tver you can: a) take cheap taxis, or b) public transportation (mini-bus, tram, trolleybus, or regular bus). The mini-buses to the towns near Tver leave opposite the train station. After such a perfect weekend in the Tver region you can just jump into the wild waters of the two Russian capitals - for cultural highlights all around the year in St. Petersburg or for dancing and imbibing in Moscow!